The joy of publishing out of print books is bringing fresh eyes to loved and lost classics, as well as the responses from original fans which often come with fond, forgotten stories of their youth. On announcing that Bloomsbury Reader will be bringing back 56 of Dennis Wheatley’s bestselling fiction novels, we have been hearing – through the office, social media, and stories over lunch with family and superfans – the nostalgic memories of teenage years, reading themselves scared with a torch under the bedclothes, and the vivid imagery they can still recall to the verb. 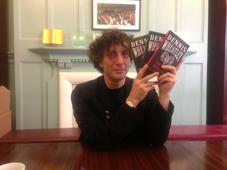 The charming Neil Gaiman was in Bloomsbury HQ this month, recounting tales of his days as a ten-year-old boy while working his way through Dennis Wheatley’s oeuvre. Eager-thumbed copies were in constant demand at his school library – Wheatley was a writer esteemed by the teachers, for his masterful storytelling, and devoured by the students, not least for the racy covers featuring bare-breasted women and risqué, occult symbolism. It is always fascinating to follow the influences of authors, hearing from writers what they were reading as their creative imagination was forming. Gaiman cited The Ka of Gifford Hillary as one of the best twists in any novel he’d read, and described, in mouth-wateringly Gaimanian style, the ghostly scenes of The Haunting of Toby Jugg that have stayed with him all these years. Both titles will be published by Bloomsbury Reader later this year. In the 1930s Dennis Wheatley was Britain’s most popular thriller writer. As the war began, he started a series of novels featuring a ruthless and charming secret agent, a connoisseur of rare wines and fancy women. Before there was James Bond, there was Gregory Sallust. Some indeed say that Sallust was the original inspiration for Bond – the ties between Wheatley and Ian Fleming being plentiful, both serving as strategists in different departments during the war. Fleming, like other novelists from John le Carré to Somerset Maugham, used their experience in Britain’s secret service to foster literary careers later in life. Wheatley, on the contrary, was a successful novelist who suddenly stepped into the pages of one of his own books. He was secretly employed by Churchill as a member of the London Controlling Section, a seven-man team within the Joint Planning Staff of the War Cabinet that was responsible for devising deception operations against the Axis Powers. Wheatley was the only civilian to be recruited, and led a disinformation campaign that foxed the Germans by cloaking Allied military plans. When Wheatley joined Churchill’s staff, he had already planted himself inside the head of the enemy—“Gregory and I had been looking pretty closely at the Nazis for quite a while,” he told an interviewer, and he had been working with strategy and deception through Sallust for years. Now he had been given free rein to exercise his thriller-writer’s imagination to help defeat the enemy in real-time. In 1943, he was one of the planners of Operation Mincemeat where a corpse was dressed up as a major in the Royal Marines and deliberately washed ashore in Spain. On the body they planted forged documents indicating the Allies planned to invade Greece and Sardinia, rather than their real target, Sicily. The German High Command diverted a significant number of troops and shipping as a result. This daring ruse later became a best-selling book and the 1956 movie The Man Who Never Was. Wheatley famously travelled for seven months of the year and wrote for the other five, his sense of exploration filtering into every page and creating characters and storyworlds to engage and inspire. We are excited and delighted to bring Wheatley back into the spotlight; an avid historian, adventurer and, luckily for us, an exquisite raconteur. Wheatley’s first published novel, The Forbidden Territory, marked a phenomenally popular literary debut in 1933 and was reprinted seven times in as many weeks. We meet, for the first time, our modern trinity of musketeers in the epicurean Duke de Richleau, financier Simon Aron, and wealthy young American, Rex Van Ryn. The Duke receives a coded message from his missing friend, Van Ryn who, while hunting for treasure lost during the Soviet takeover of Russia, is now in prison somewhere in that vast country. Along with the Duke, good friends Simon Aron and Richard Eaton set off on a secret mission to secure his escape. Without official papers they lead a thrilling caper, hunted by the Secret Police, through Siberia and across the plains of Soviet Russia. The Devil Rides Out, first published 1934, is the sequel to The Forbidden Territory and the second in the Duke de Richleau series. This story cemented Wheatley’s hero’s popularity, and simultaneously, marked Wheatley’s debut as an acclaimed occult writer. Set in 1930s London, the Duke de Richleau finds himself dragged into the world of devil worshipping and dark secrets, as he must rescue his friends from the clutches of a satanic order. In 1967, a cinematic adaptation was made by the iconic Hammer Films, with Sir Christopher Lee playing the Duke de Richleau. To the Devil a Daughter, published in 1953, is one of Wheatley’s most terrifying and masterful horror tales. A young girl goes out every night for short walks, she is frightened, and animals shy away from her, but she has no idea why this is happening. It becomes apparent that she is bound to a horrible fate, and her neighbour, Molly Fountain, with the help of a wartime Secret Service friend, seeks to expose the terrifying truth. A classic fantasy horror, the novel served as the inspiration for the 1976 Hammer Films horror-production, once again starring Sir Christopher Lee. Tags: Christopher Lee, Dennis Wheatley, Ian Fleming WWII, James Bond, Neil Gaiman. Bookmark the permalink. Previous post ← Happy Birthday Bloomsbury Reader and Welcome Classic Crime Club!